It's a beautiful spring-like day here in the Portland/Vancouver area. because I know that it's a whole lot easier to give thanks when the weather is lovely and life is going well. giving thanks has to be an act of the will, a choice, because your emotions sure won't feel like being grateful. the God Who created you and Who loves you fiercely, is in control. There's nothing happening to you right now that has caught Him unaware or by surprise. ask Him to open your eyes to see the evidence of His presence with you. Then give Him thanks for those things. The reins really are in God's hands even though your circumstances feel the opposite of under control. hugs and love to you, too! So very timely. 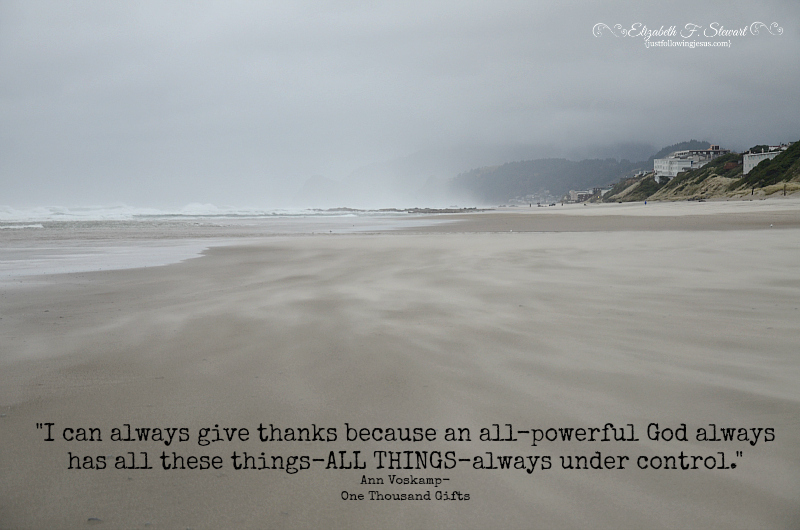 And your words echo my own in my blog post today - God is in control. Even when we can't see Him at work, or our sense of His presence is vague, HE IS THERE. I'm behind on my blog reading. Can't wait to read your post! You are so right, Elizabeth, about the power of gratitude to keep discouragement and depression at bay in times of pain, trial, or hardship. Also, 'loved your personal list of praises for the week--proof that even the small delights of life really do have tremendous value!